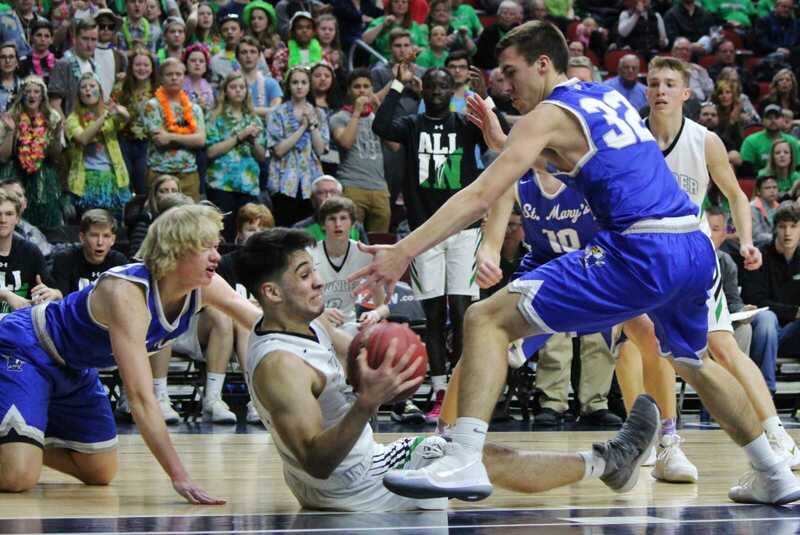 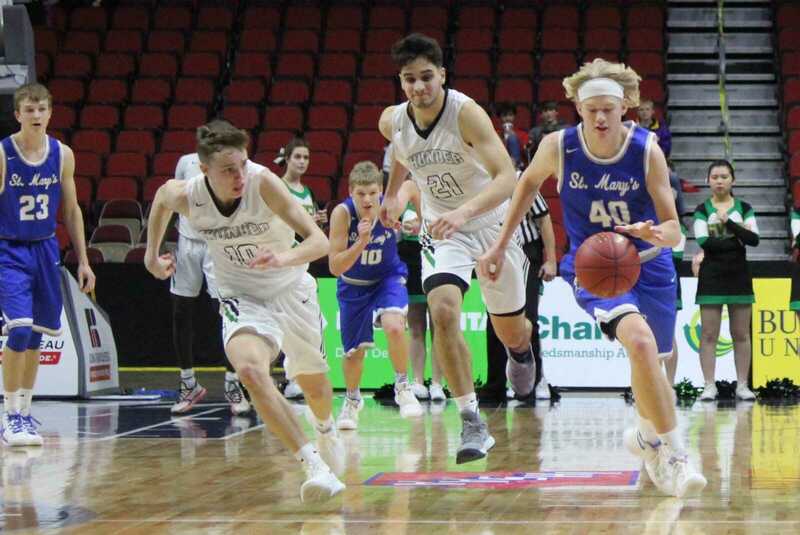 The Remsen St. Mary’s Hawks took fourth place out of 148 Class 1A teams. 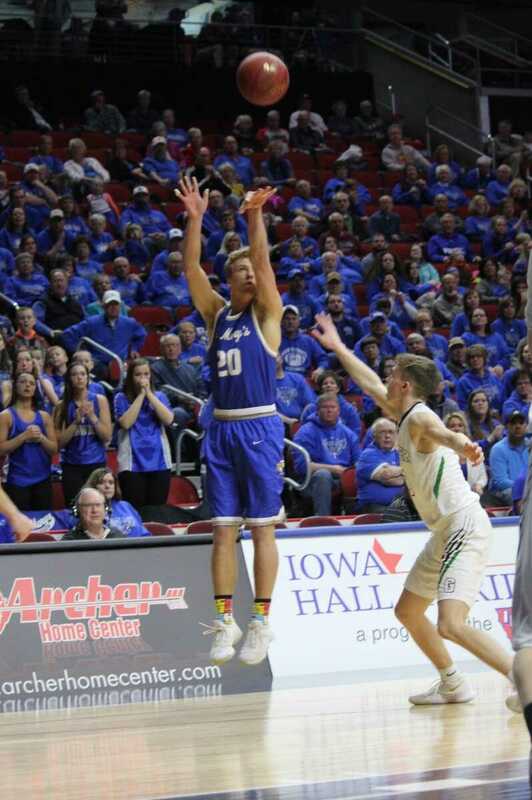 The Remsen St. Mary's Hawks took fourth place out of 148 Class 1A teams. 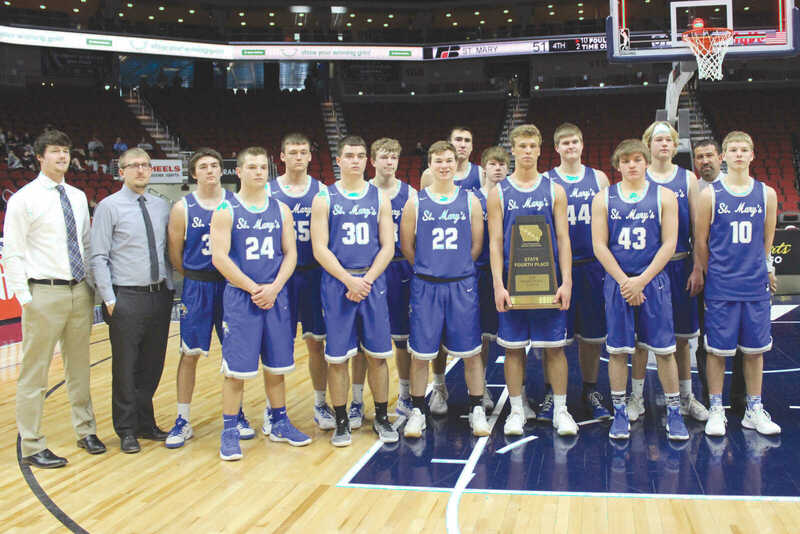 Pictured with their trophy at the Wells Fargo Arena in Des Moines include, from left: Coach Tyler Delperdang, Coach Travis Kohler, Skyler Waldschmitt, Mitchell Schiltz, Brady Homan, Brett Galles, Brody Ricke, Brayden Ricke, Nick Ruden, Blaine Harpenau, Carter Kuchel, Zach Ruden, Noah Schroeder, Derrick Schorg, Coach Scott Ruden, and Spencer Schorg. 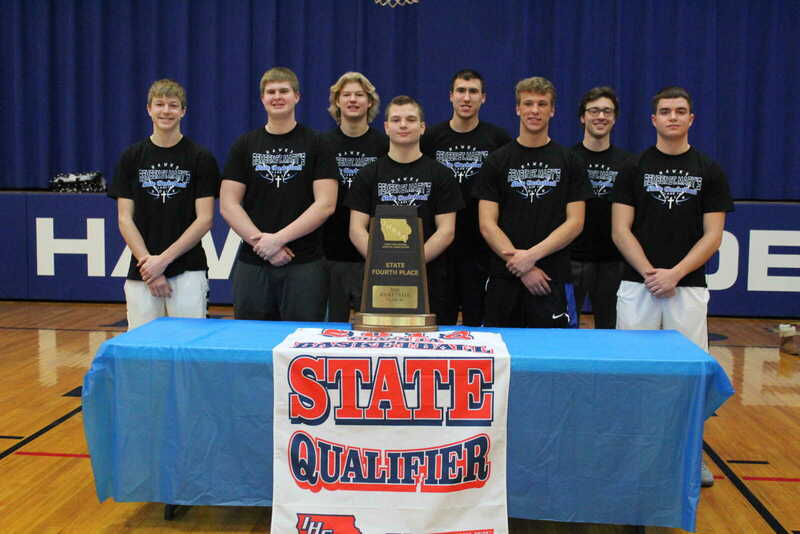 The seniors, pictured from left: Brody Ricke, Zach Ruden, Derrick Schorg, Mitchell Schiltz, Nick Ruden, Carter Kuchel, David Grady, and Brett Galles, finished their high school careers with an impressive record of 81-20. 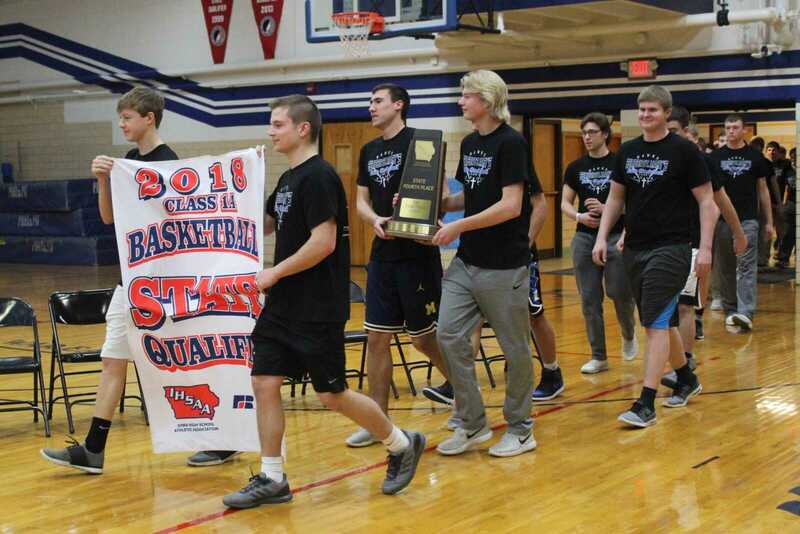 The Hawks carry in the state qualifier banner and trophy into the gym during the Welcome Home Celebration. 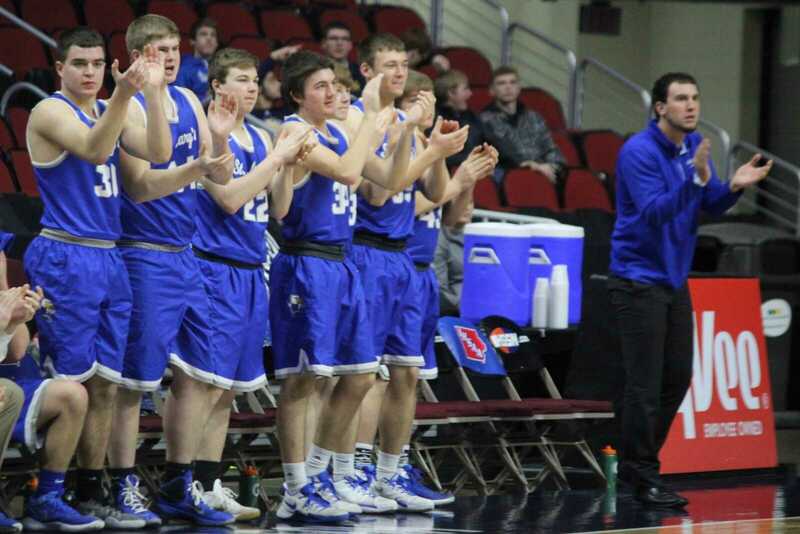 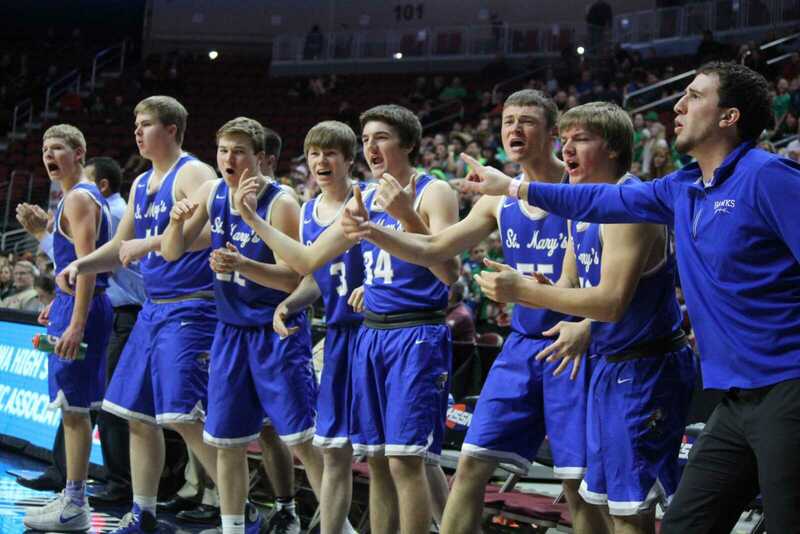 The bench cheers on their teammates at the State competition. 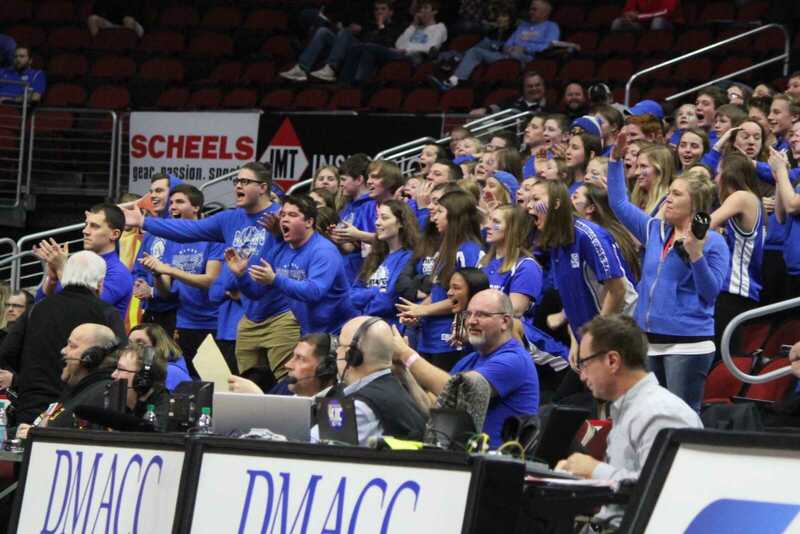 The Blue Crew reacts to a big defensive play by the Hawks. 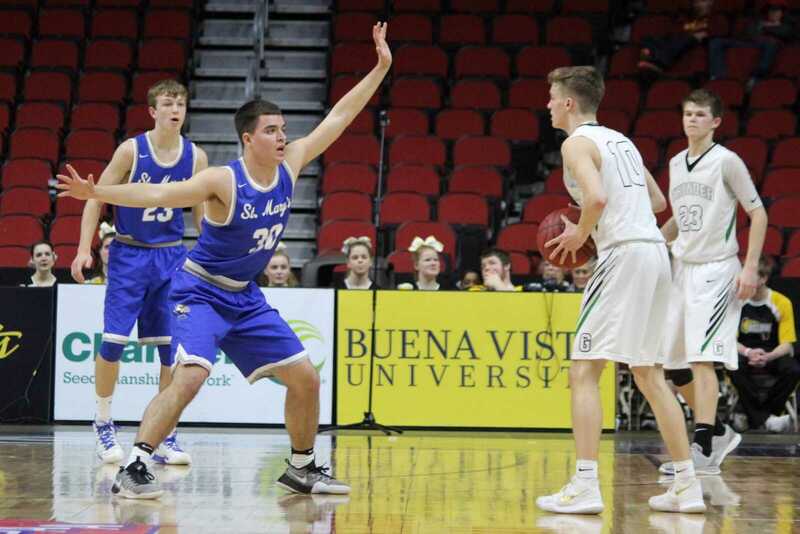 Brett Galles and Brody Ricke guard against Grandview on Wednesday. 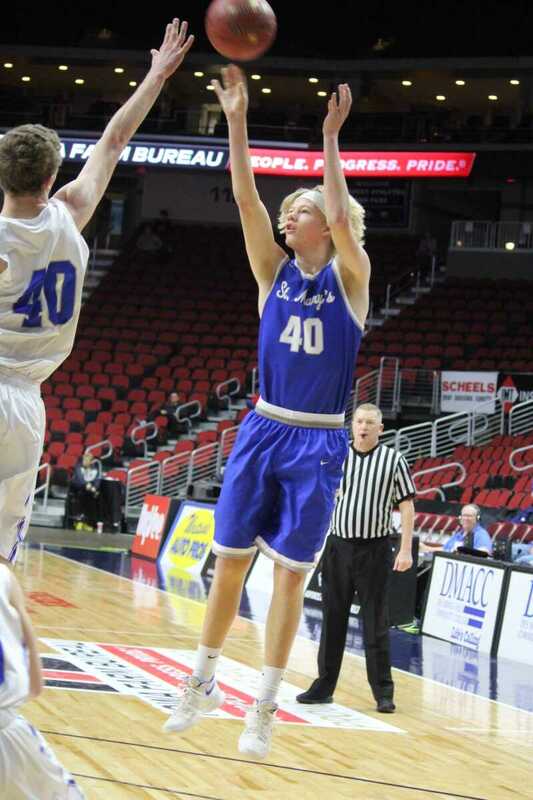 Brody Ricke capitalizes on a stolen ball with two points. 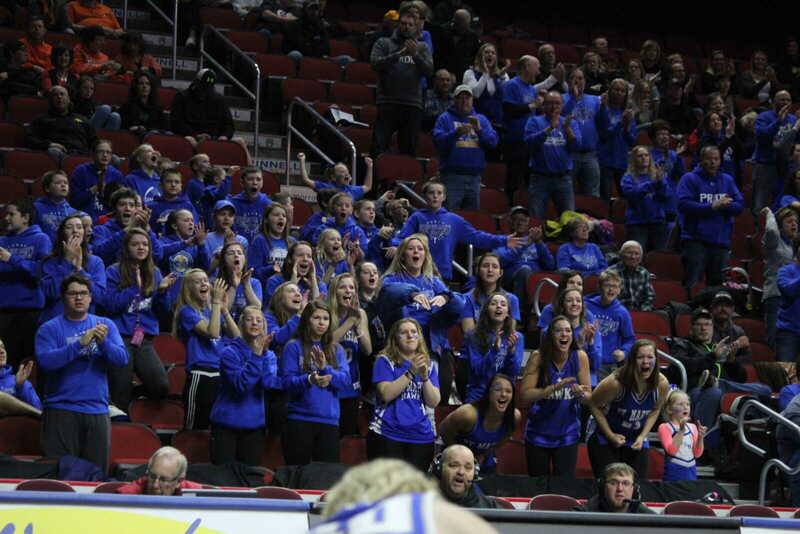 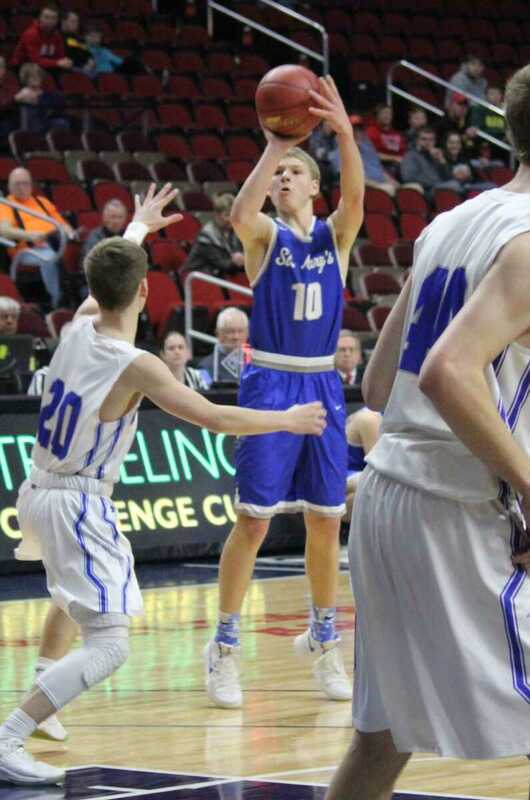 The crowd holds their breath as Carter Kuchel shoots a three-point shot. 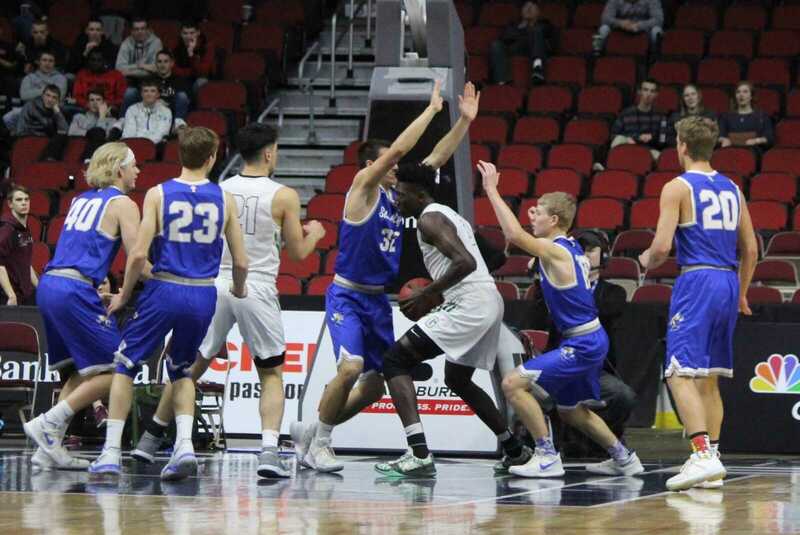 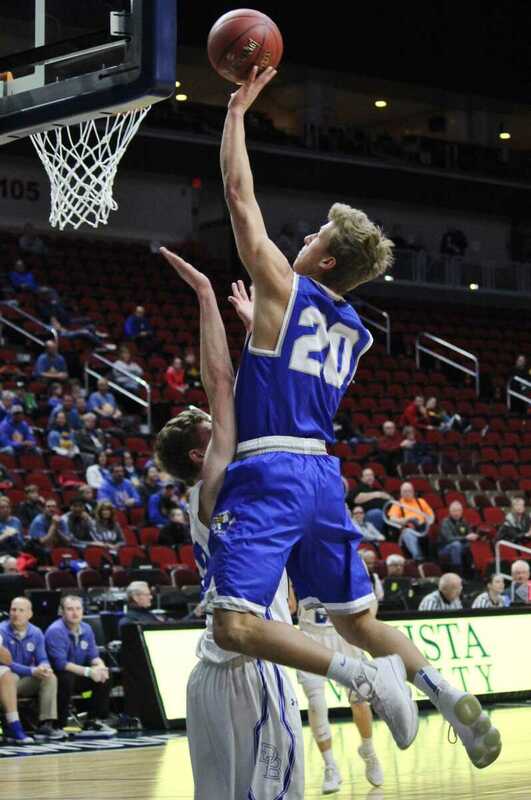 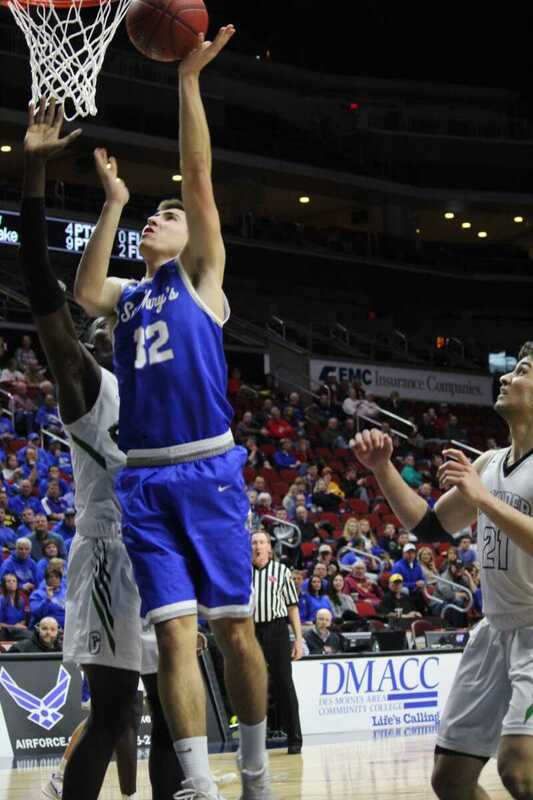 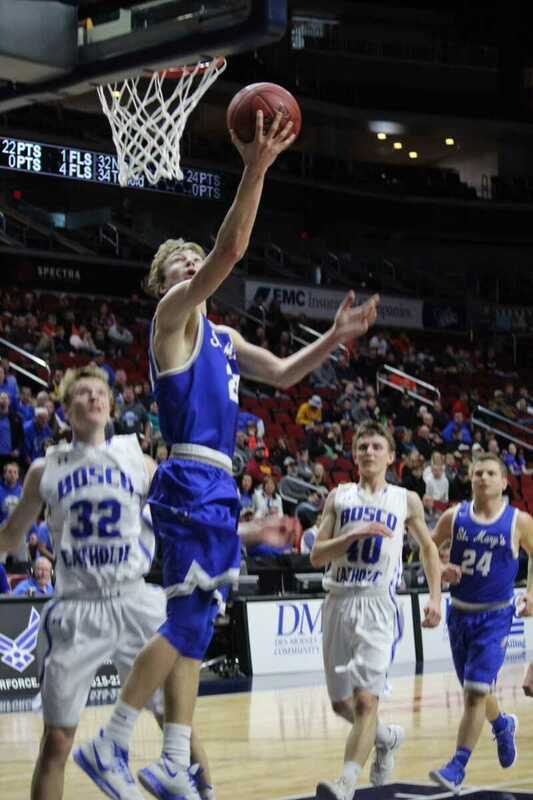 Carter Kuchel shoots over top a Don Bosco player. 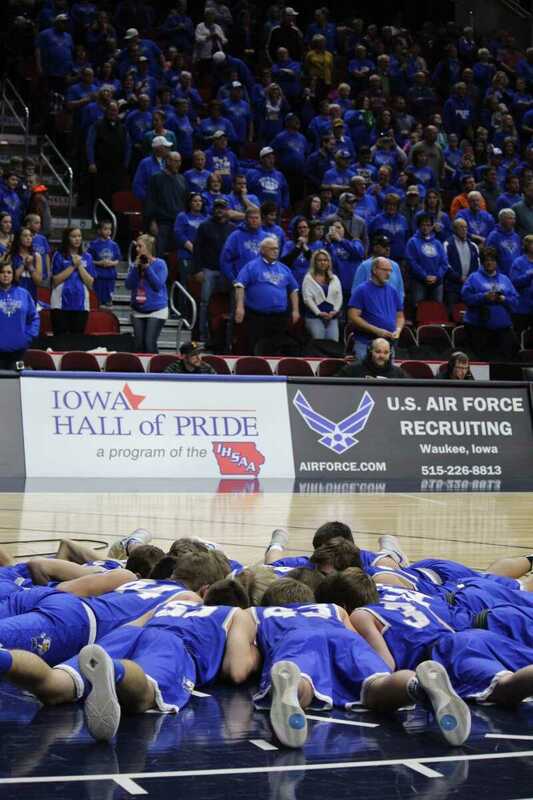 The Hawks huddle on the floor before the State semi-final game. 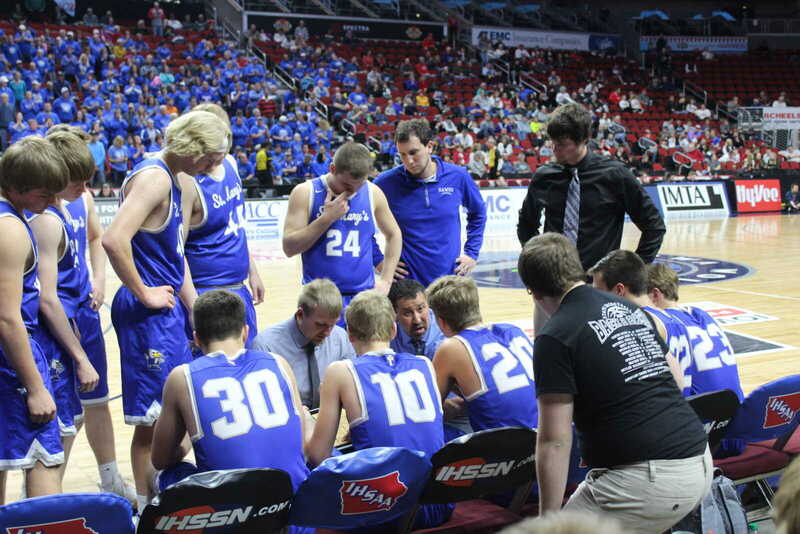 The Hawks listen to instructions from head coaches Scott Ruden and Travis Kohler. 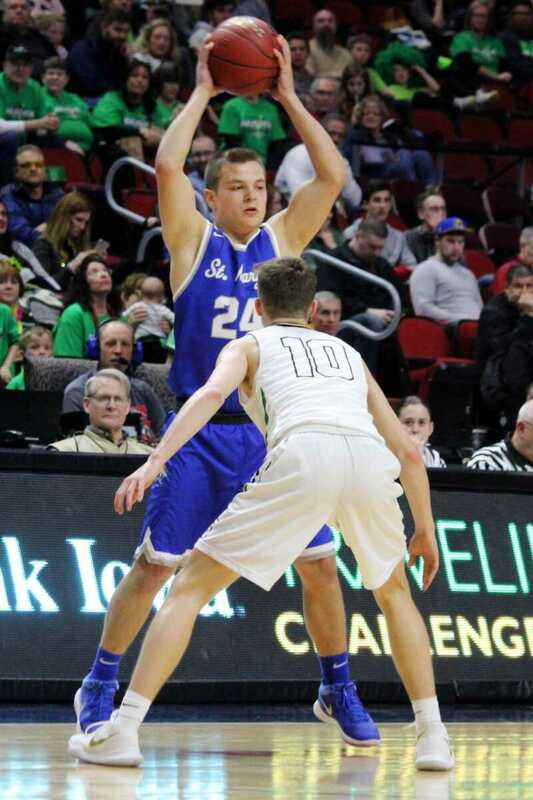 Mitchell Schiltz looks to pass to a teammate. 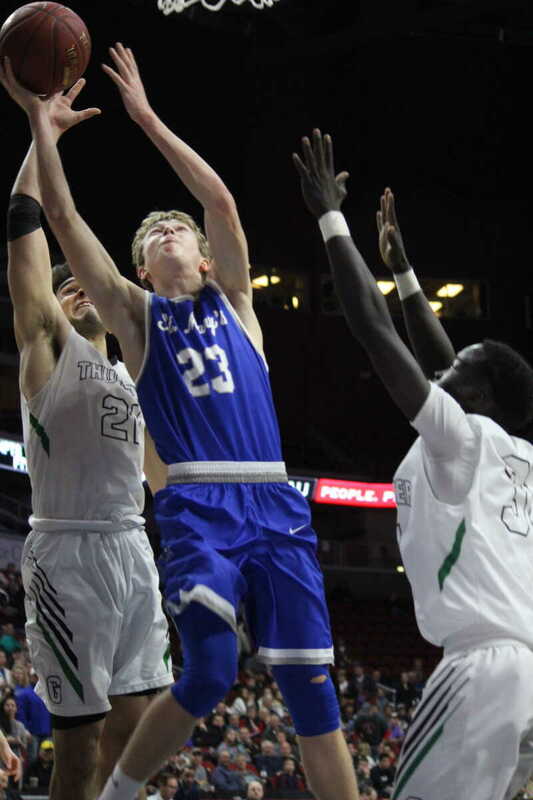 Nick Ruden puts in a layup against Grandview. 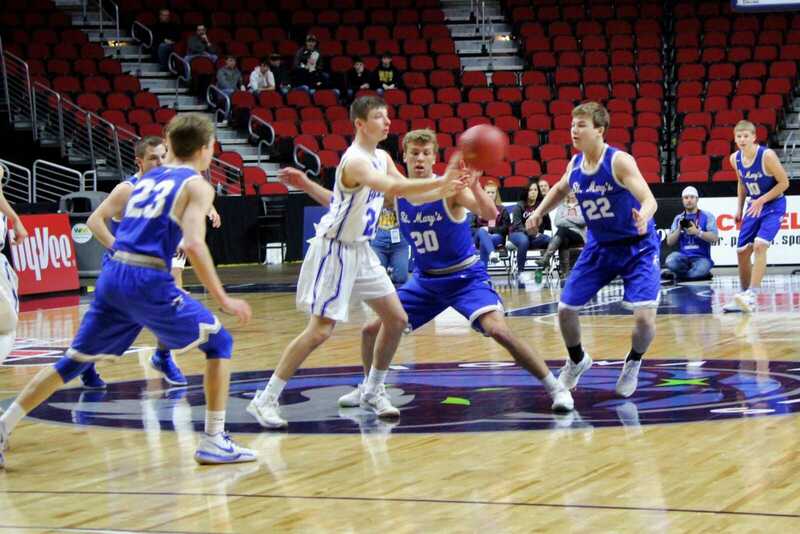 From left, Derrick Schorg, Brody Ricke, Nick Ruden, Spencer Schorg, and Carter Kuchel work together on defense.